The following sighting of a UFO over the cities of Corrientes and Resistencia in the early morning hours of Monday, 17 April 1950, constitutes the oldest case we have documented in the territory of the province of Corrientes, and is also the oldest we have on record for the Province of Chaco. The article we are presenting here was published by the El Nacional newspaper of Corrientes on Tuesday, 18 April 1950 (Archivo General de la Provincia de Corrientes - El Nacional / 16 / Corrientes/ 1-III-1950 / 7-V-1950). 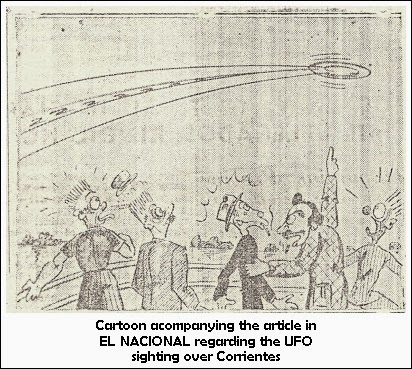 "A Flying Saucer Was Seen From Avenida Costanera"
It has been said once again that one of the extensively discussed "flying saucers" appeared over our city. According to the statements of responsible persons who appeared in our newsroom, this occurred yesterday morning and its variable luminosity drew the attention of those who happened to be in places where it was readily possible to see it. According to our sources, which include certain magistrates who do not want to their names known for obvious reasons, the phenomenon was seen with great clarity and its swift movement confirms all that has been said elsewhere about this strange and mysterious device. The place from where it was seen - Avenida Costanera - enabled its characteristics to be seen with certainty and it is easy to imagine the commotion that ensued, with conjectures as to its real meaning becoming renewed, whether as a secret weapon or a means of supersonic travel. Moreover, news received from the neighboring Chaco territory state that the same thing was seen there, ratifying the truth of the statement. Unquestionably, the "ducks" [sic] or whatever they are, truly exist. The only mystery is their origin..and their destination. Other information received from another source, an astronomer of this community, advises us that the strange silvery object seen over Corrientes and El Chaco by multiple witnesses was nothing more than the planet Venus, whose intense luminosity makes it visible due to extreme proximity to the Earth. It should be kept in mind that the latter took place only briefly over Capital Federal, where commotion over the "flying saucer" had sensationalistic features. The sighting was subsequently debunked by meteorological observatories. Let us hope that time, in its inexorable march forward, confirms or denies so much information and theories over this intriguing matter. RESISTENCIA, 17 (C.) - Around noon today, the people of Resistencia, without exception, looked to the sky to see a "flying saucer" that according to some, vanished toward the southwest in the horizon, after tracing a curve in the sky. According to others, however, it was nothing more than Venus, which was a great cause for conversation in Paraguay a few days ago. The fact is that the widest variety of conjectures and theories was put forth about this subject. The comments were the talk of the day in every meeting. Not few people awaited the landing of the famous disk after what was reported by EL NACIONAL regarding the event that occurred in Patagonia. But the "disk" went away, leaving doubts in its wake and a knowing smile on the mouths of incipient local astronomers. Desde la Avenida Costanera fue visto un Plato Volador. in El Nacional, Corrientes, 18 de Abril de 1950, Año del Libertador General San Martín, p. 6.